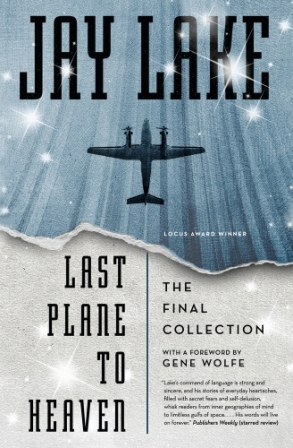 Last Plane to Heaven, the final collection of stories by the late Jay Lake, won the 2015 Endeavour Award announced November 20 at OryCon. Lake died in June 2014 following a fight with cancer. The Award comes with an honorarium of $1,000 and honors a distinguished science fiction or fantasy book, either a novel or a single-author collection, created by a writer living in the Pacific Northwest. The judges for the 2015 Award were Russell Davis, Esther Friesner, and Fran Wilde. 2016 Award Eligibility: To be eligible for the 2016 Endeavour Award the book — either a novel or a single-author collection of stories — must be either science fiction or fantasy. The majority of the book must have been written, and the book accepted for publication, while the author was living in the Pacific Northwest (Oregon, Washington, Idaho, Alaska, British Columbia, or the Yukon.) The deadline to enter books published during 2015 is February 15, 2016. Full information on entering the Award is available on the Endeavour Award website. This entry was posted in Awards and tagged Endeavour Award, Jay Lake by Mike Glyer. Bookmark the permalink. Dammit. I still get teary-eyed every time Jay Lake comes up. Good for him. Good for the judges. The award was accepted by Ken Scholes and Jay’s daughter; I’m not sure there were any dry eyes in the audience.